Our little Tommy is very scared of people so we thought the only way to groom him is to sedate him. However our vets recommended Anita as an alternative to that. I never thought Tommy would act so calm around other people, specially when being groomed, but we were amazed the way the session went on. Anita really understands how cats behave and using her great calming techniques she managed to groom Tommy in a very short amount of time and without him being stressed. We highly recommend Anita, specially if you have a difficult cat like we do. Thank you Anita! 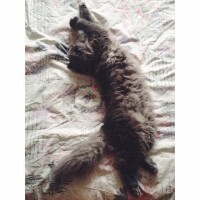 If you have found yourself on this page, are a cat guardian and live in London, then it’s more than likely that you will be seeking cat grooming in Shepherds Bush or anywhere else in and around London – to visit your home to holistically groom your cat. Tommy was happy with our cat grooming in Shepherds Bush service and your cat will be too!